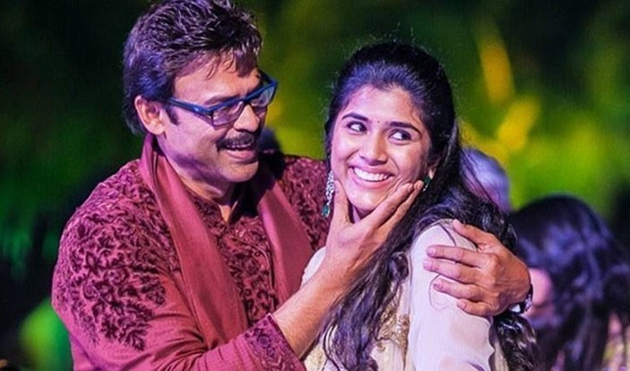 Venkatesh's Daughter Aashrita is all set to marry Hyderabad Race Club chairman Surender Reddy's Grandson Vinayak Reddy. Engagement Ceremony took place at Venkatesh's House in Manikonda last month. Only family members, close relatives and friends graced the occasion. Even the Wedding Ceremony is going to be no different from the Engagement. Only Relatives and Dearest Friends in Tollywood will be invited for the destination wedding scheduled to happen in Rajasthan. It's going to be a private affair! Wedding Celebrations had already begun in Daggubati Family. Rana Daggubati, Naga Chaitanya and Samantha were preparing to have a blast during the Sangeet Ceremony. Media isn't able to obtain even a single engagement photograph till date. Nobody have any clue about the auspicious muhurats and dates preferred by both the families. Such is the security arrangements done by the Daggubatis. Post the wedding, Venkatesh will be hosting a lavish reception for the who's who in the Indian Film Industry and also people from different walks of life in Hyderabad. No stone is left unturned to make every moment as special as possible. Send your best wishes to the soon-to-be-wed couple!